Ocean acidification (OA), often called “the other CO2 problem”, is a consequence of an increased release of anthropogenic carbon dioxide. Man-made CO2 does not only accumulate in the atmosphere, it also dissolves readily in seawater thereby releasing protons with, as a consequence, an increase in seawater acidity. The acidity of the oceans has increased by about 30% since the beginning of the industrial era, and may increase by more than 150% by the end of the century. This increase in acidity impacts the lives and well-being of many marine organisms and can also disrupt coastal and marine ecosystems and the services they provide. Among threatened ecosystems, coral reefs are probably the most sensitive to both climate change and ocean acidification. The Centre Scientifique de Monaco is particularly involved in the scientific study of the impact of this environmental change on marine organisms, and more particularly on coral reefs since the 90s, developing studies from the molecular mechanism of action of OA to socio-economic impacts on coastal human societies. Scientific research at the CSM is associated within the Association Mongasque pour lAcidification des Ocans (AMAO), which includes media and funding activities carried out in the Principality of Monaco to communicate, promote and facilitate international actions on ocean acidification and other global stress factors affecting the marine environment fully supported by HSH Prince Albert II. California is a founding member of the International Alliance to Combat Ocean Acidification (Alliance; https://www.oaalliance.org/), which is a network of governments and affiliate (NGOs, universities, businesses, and associations) members responding to the threats of ocean acidification and changing ocean conditions. Marine diatoms are important primary producers that thrive in diverse and dynamic environments. Using the model species Thalassiosira pseudonana, we demonstrated in a detailed physiological and transcriptomic survey that approximately 40 percent of the transcriptome varied significantly and recurrently, reflecting large, reproducible cell-state transitions between four principal states: I) “dawn,” following twelve hours of darkness, II) “dusk,” following twelve hours of light, III) exponential growth and nutrient replete, IV) stationary phase and nutrient depleted. Repeated shifts in the transcript levels of hundreds of genes encoding sensory, signaling, and regulatory functions accompanied the four cell-state transitions, provided a preliminary map of the highly coordinated gene regulatory program under varying conditions. These results explain, in comprehensive detail, how the diatom gene regulatory program operates under varying environmental conditions (Ashworth et al. 2013). The ocean has absorbed about one third of the anthropogenic carbon dioxide (CO2) emissions since the industrial revolution, greatly reducing the impact of this greenhouse gas on the climate. However, this massive input of CO2 is generating global changes in the chemistry of seawater, especially on the carbonate system. These changes are collectively referred to as ocean acidification because increased CO2 lowers seawater pH (i.e., increases its acidity). Recent studies have shown that the resulting decrease in ocean pH will make it more difficult for marine calcifying organisms, such as corals, molluscs, and calcareous plankton, to form biogenic calcium carbonate, and existing calcium carbonate structures will become vulnerable to dissolution. Thus, ongoing acidification of the oceans poses a threat to ocean-based security. There are concerns that marine ecosystems will change, that biodiversity will be lost, and that important ecosystem services that human societies depend upon for food security, livelihoods, and coastal protection could be significantly impacted. 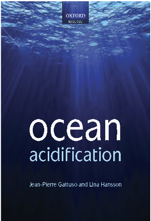 Unfortunately, the effects of ocean acidification on organisms and ecosystems remain poorly understood, with most of our knowledge based on simplified laboratory experiments. As the Alaska Ocean Acidification Network approaches its first birthday, a new executive committee and a set of working groups are poised to help advance ocean acidification in Alaska. The working groups will be focusing on the topics of Outreach & Communication, K-12 Education, Engagement with the fishing community, Engagement with Tribes, Policy, and Research & Monitoring. Most are set to have their first meeting in the next month. If you are interested in joining a working group, please email Darcy at dugan@aoos.org. Summaries from committee meetings and updates from working groups will be posted on the Alaska OA Network website under “Network documents“. To attend this press conference remotely, tune in to the event via Periscope livestream by following @PCCleads on Twitter! SAN DIEGO, Calif. – Today leaders representing U.S. cities, states, businesses and national governments from around the globe, joined together to sign onto the newly formed International Alliance to Combat Ocean Acidification. 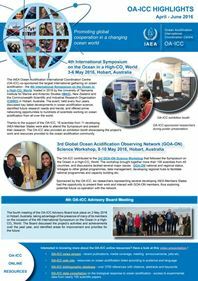 Members who commit to joining the OA Alliance will work collaboratively and individually to take actions that combat ocean acidification and changing ocean conditions, moving climate policy forward regardless of the national political winds. Scientists have found that ocean acidification resulting from greenhouse gas emissions has increased by 30 percent and is expected to double over pre-industrial levels by the end of the 21stcentury. The oceans are the primary protein source for 2.6 billion people, and support $2.5 trillion of economic activity each year. However, drastic changes are occurring in our oceans – from oyster hatchery die-offs to coral reef bleaching – that are being felt by coastal communities around the world. A formal launch event of the OA Alliance is taking place at Hotel del Coronado in San Diego on Tues. Dec. 13 at 10 a.m.